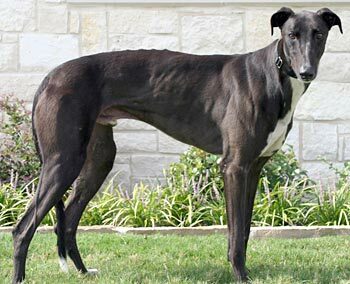 Pete, aka RZ Perfect, is a two-year-old, handsome, black male born September 19, 2007. 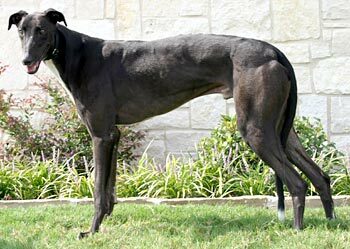 His sire is Trent Lee and his dam is RZ Sally Lee, making his grand sire the late famous Gable Dodge. He has a stunning white tuxedo which gives him such an elegant appearance. 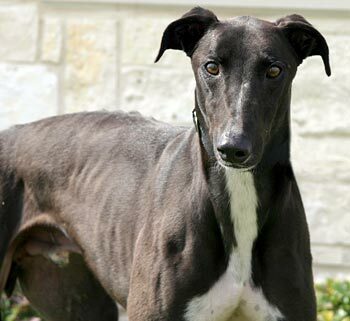 Pete was not a contender at the race track, but sure is one to be the “perfect” companion pet. Pete's cat test: Pete showed no interest in the cat indoors. The cat walked around, laid on the floor...no interest in getting that close. After being encouraged to at least get a sniff, Pete was allowed to roam the house without leash or muzzle. Outdoors was a different matter. After passing his cat test, he saw another cat approach outdoors and thought it was very interesting to follow and took a snap. Missed the cat, but he got a second round with the cat indoors. Still no interest. When we came back out, the other cat was lying on the front porch and Pete wasn’t as interested. Indoor cat and outdoor cat are completely different situations and we always advise close supervision when introducing a new Greyhound to a household with feline members.